When I was just starting out in college, I noticed something. I was starting to get dark circles under my eyes. Of course I immediately just chalked it up to me starting to sleep later. I could always just dab on some concealer anyway. I then eventually began to wonder, was it really just my terrible sleeping habits causing them? I have an average bedtime of 3AM, and sometimes I’ll even go to bed at 5AM. I don’t have insomnia, I just don’t like sleeping early. It’s weird, I know. It was only when I visited a doctor some months back did I learn that my dark circles were actually caused by my allergies which started getting worse after high school. I did a bit of research and yup, it’s true: “Very often under-eye darkness is sign of an allergic reaction, as the eyes and nose are affected by indoor or outdoor allergens that the body overreacts to…Sometimes the dark circles stem from nasal congestion, which is also a sign of allergy.” (source) Now I have a legitimate excuse for when people nag me to sleep earlier when they see my dark circles, haha. As you’d expect, concealing my dark circles is part of my everyday makeup routine, especially if I want to appear more awake and not look like a Tim Burton character. I sometimes wear glasses too, so if I don’t then my dark circles are just emphasized thanks to the shadow the frames cast. Normally I tend to just neutralize the color of or conceal my dark circles, I don’t usually bother brightening them anymore. But one day I wondered, why not try doing that more often? Maybe it’ll make me look even more fresh and awake! 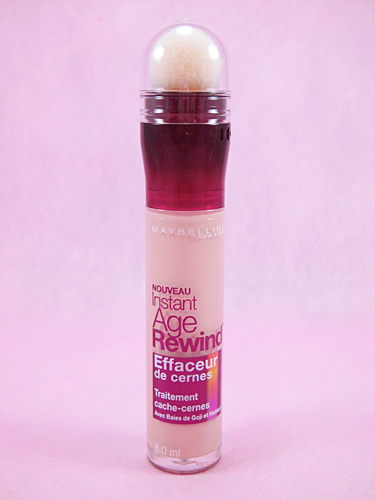 So I got the Maybelline Instant Age Rewind Eraser Dark Circles to help me do just that. Product description: Active Formula and Micro-Corrector Applicator erase dark circles, puffiness and fine lines instantly. Alright, aside from the strangely worded product name (shouldn’t it be ‘Dark Circles Eraser’ instead? ), I like the packaging this comes in. You get 6.0ml of product inside a durable plastic…wand or tube of sorts that has a sponge tip applicator, with a cap too, of course. Anyone else also like the color theme of the Instant Age Rewind line too? I think it’s cute and yet still appropriate for more mature ladies. 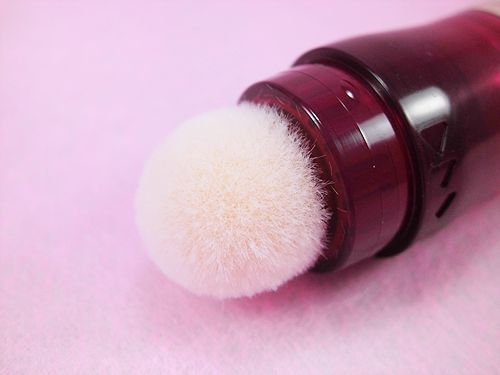 The sponge tip is very soft and quite fluffy. The second pic is some of the product being dispensed which you do by twisting just underneath until you see it starting to soak the sponge. It took me a lot of twists before I started to see anything come out. For a minute I thought I got a faulty item. 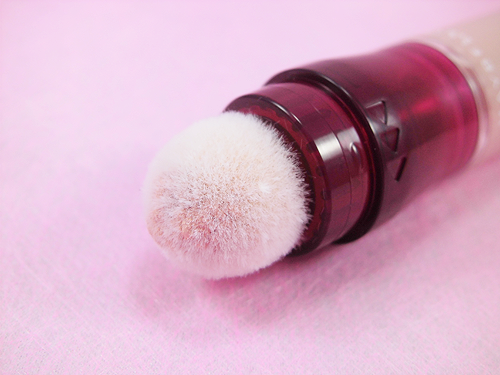 You can’t remove the sponge tip to clean it so those who are very hygiene or germ conscious when it comes to makeup applicators might not like this too much. But, you can always try applying the product onto the back of your hand instead and work from there. Since the applicator isn’t that small either, you can’t be very precise with it and applying with the sponge can be a bit tricky. I always get some of the product on my lower lashes or waterline. There are six shades available for this. Mine is in "160 Brighten". If I’m not mistaken, the other shades are actual concealers meant to neutralize or conceal your dark circles, whereas this is just really meant for brightening your under eyes. 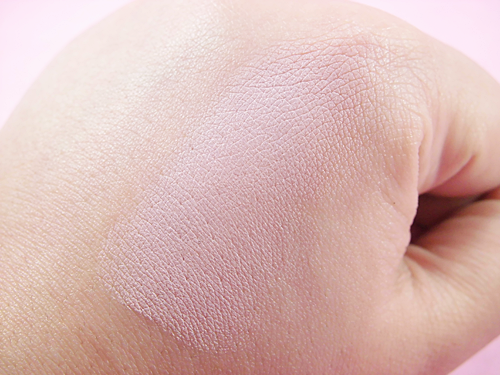 Already by looking at it you can definitely see it has a strong pink undertone. When it comes to dealing with dark circles, peach or pink tones counteract the usually purple-ish tones under our eyes that make up our dark circles. Although, for extreme dark circles, a corrector is what’s recommended most of the time because a concealer can only do so much when it comes to covering them up. I think that’s what makes this product more of a corrector than a concealer. Well, talk about reverse panda eyes! When I first tried on the product on its own, I knew it was much too light. I understand that it’s meant to brighten, but it just made my under eyes look too bright. 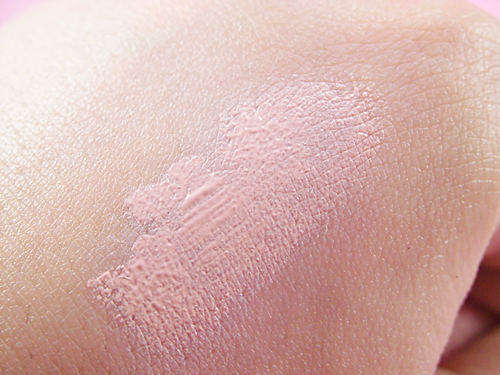 Also, since my skin has a yellow undertone and this has pink, it just looks strangely…off on me. More so if you see me in real life and not when I’m facing natural light directly like I am for these pictures. I decided maybe neutralizing the color first would help, so I tried applying my MAC Select Cover-Up in NW25 first then put the Instant Age Rewind Eraser after. 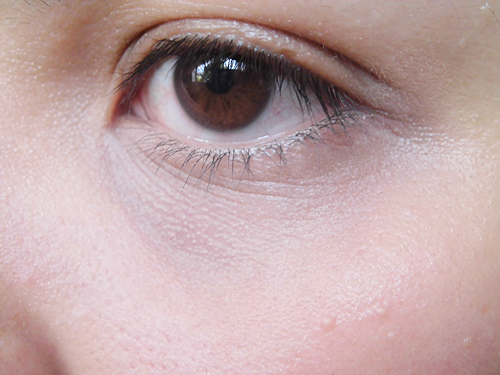 After all, Maybelline says ‘Apply neutralizer shade for extreme dark circles’, which is what my Select Cover-Up is. 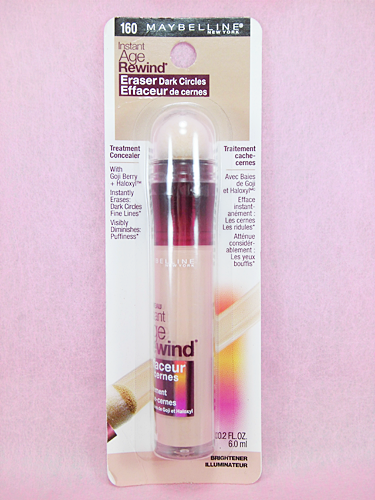 That’s why I got it in NW25 for it to just neutralize the dark circles instead of brighten them. Doing that helped a little, meaning it was no longer as bright (or should I say white at this point), but it was still too light in color for my liking. Now I wish I had gotten another shade instead! 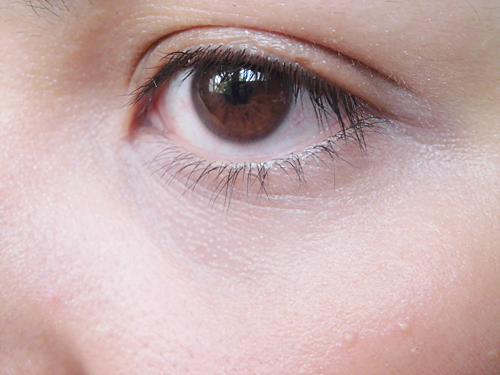 Something like my Select Cover-Up that would neutralize and/or cover up the dark color of my under eyes instead. I have yet to try this with a concealer or type of base makeup (foundation, BB cream, etc.) on top of the product though. I’m sure that’ll help and keep the brightening effect, but reduce it just enough so that it’s not too much. I don’t have any puffiness under my eyes so I can’t comment on whether it really helps reduce them or not, and my under eyes don’t feel any smoother after applying this. I think this product would be best for those with fairer skin tones (NC20 and below) and who have a pink undertone to their complexion too. It would also help if your dark circles aren’t as dark as mine because you wouldn’t have to apply as much as I should and you can avoid the reverse panda eye look even more. Affordable. This was definitely less than $10. The sponge applicator is very soft. The formula isn’t that drying, but I still need to use an eye cream to moisturize beforehand. The formula isn’t thick nor is it too thin and runny. It’s much too light for me and makes my under eyes look too bright. Sinks into fine lines a little. It doesn’t seem to ‘smoothen’ out my under eyes. You can’t remove and clean the sponge applicator. 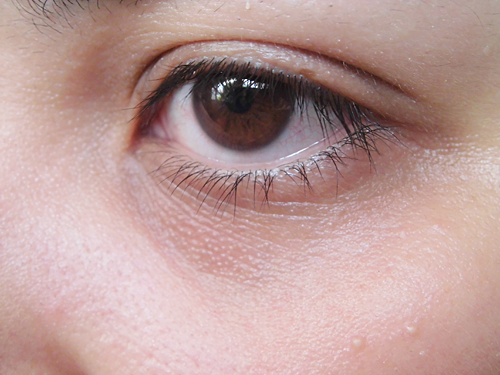 If you have extreme dark circles, you’ll need to use a neutralizing concealer/corrector first.